We are sooooo excited that we will not only be at 1 amazing boutique this weekend but, 2!!! The fun begins on Thurs. Sept. 18th @ 9:00 a.m.! We will be at Terri's Blue Goose Boutique on Thurs. Sept 18th 9:00 a.m.-8:00 p.m, Fri. Sept. 19th 9:00 a.m.-8:00 p.m & then Sat. Sept. 20th 9:00 a.m.- 6:00 p.m.! The action takes place at the Lehi Legacy Center: 123 N. Center St. in Lehi. Come and See! We will also be joining our friends from Oh Sweet Sadie! at Suncrest in Draper on Fri. Sept. 19th from 9:30 a.m- 7:00 p.m. & again on Sat. Sept. 2oth from 9:30 a.m.- 5:00 p.m.! Don't miss this one, 'cause it is not only going to be full of an amazing aray of vendors (80+) but, it is taking place in a $1,000,000 custom home overlooking Utah County. Come check it ALL out! Oh! 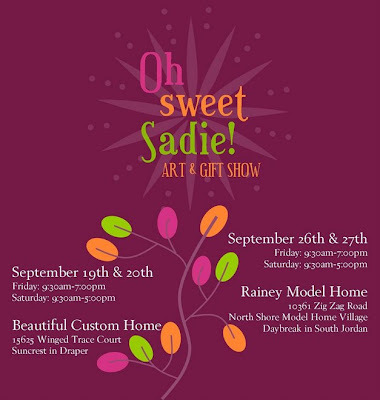 and don't miss out on ALL of the amazing Giveaways that Oh Sweet Sadie! is doing on thier Blog! You could win some SUPER COOL stuff! FREE Stuff and Lots of Great Shows! Nie Nie Auction...on hold. Sorry.